Click the “Comment Now!” icon, complete the required fields, and enter or attach your comments." If you look at both links, the web address are different but will bring you to the federal e-comment page. All you have to do then to 'MAKE A COMMENT' is to then 'CLICK' on the link. After that, make your comment, 'SUBMIT.' It may take up to 24 hours for your comment to be posted. This is normal so do not fret that it has lost been somewhere on the worldwide web..
1- Just yesterday I made a statement to three for-hire industry owner/operators to consider this public comment on par to attending an only one night showing. It is going to take a few moments of your time, but as a fishermen you should do whatever is possible to put your thoughts on this particular matter into the electronic public comment form. This is your one chance to make your personal input on this topic, so do not miss out when you have a chance to do so. 2- Those in the FOR-HIRE INDUSTRY..... "where the heavens are you on this?" For those who are always spending their awake moments in spending time on the socialized media platforms, consider this part of the reason why you are in the fishing business. THIS IMPACTS BOTH YOUR BUSINESS AND THE FISHING INDUSTRY. A public comment can be as simple as, "as someone in the for-hire industry and providing a service for my recreational fishing customers, I am in full support on the opening of the Striped Bass - Block Island Transit Zone." 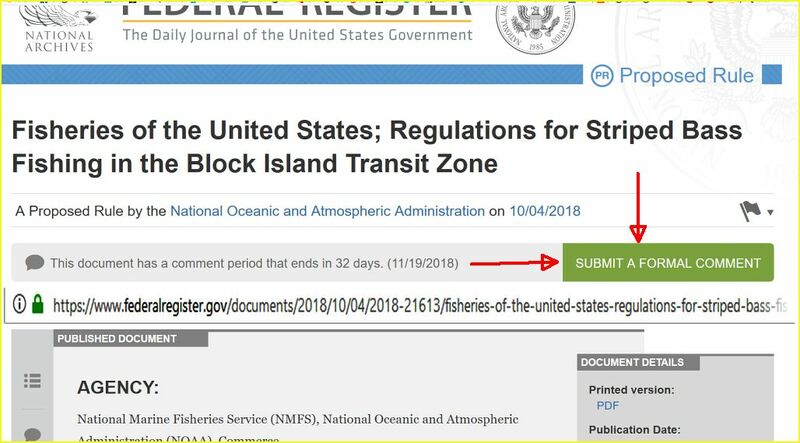 b) It is noted in the FEDERAL REGISTER with this statement and pay attention to RECREATIONAL FISHING and the three actions involved, to wit; "to authorize recreational fishing in the Block Island Transit Zone. 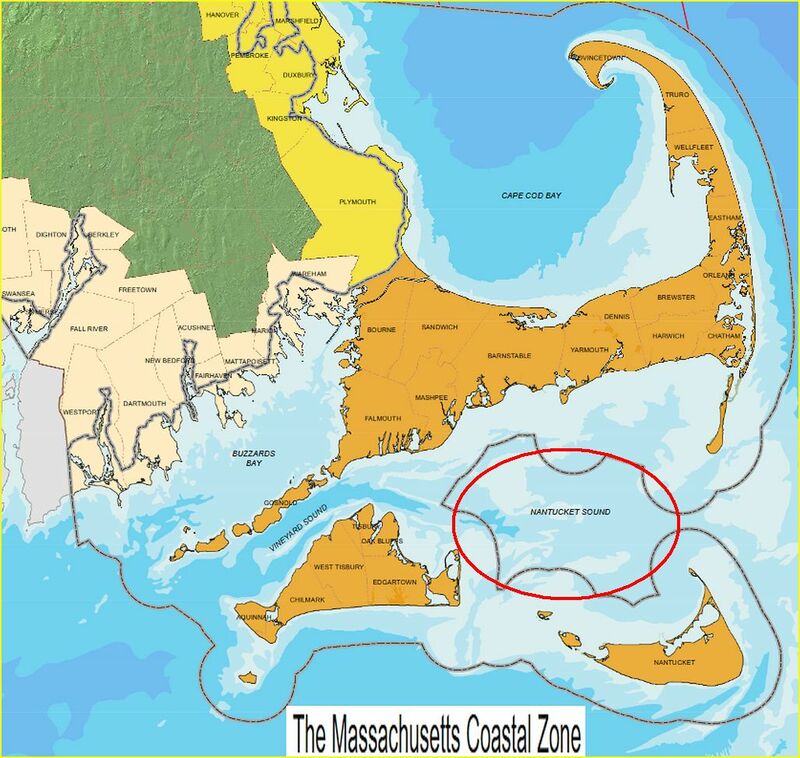 This would allow recreational fishermen to 1 - harvest, 2 - retain, and 3 - transport striped bass within the Block Island Transit Zone." 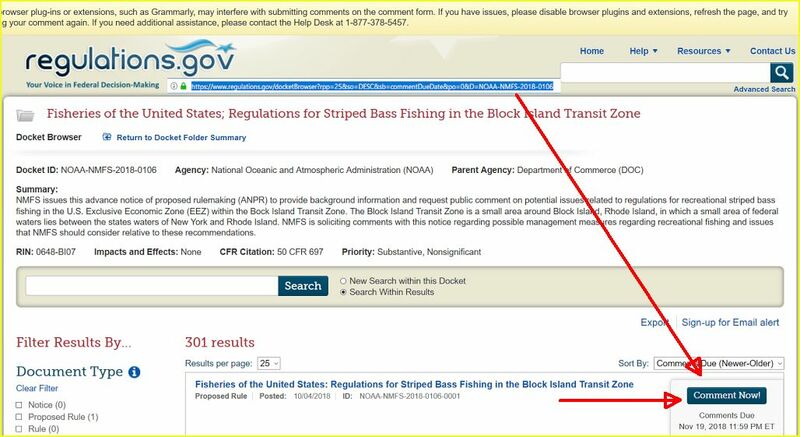 c) It is noted in the FEDERAL REGISTER with this statement in not allowing COMMERCIAL FISHING in the BITZ, to wit; "NMFS 'IS NOT PROPOSING TO ALLOW' commercial striped bass fishing in the Transit Zone, consistent with Executive Order 13449 (October 24, 2007; 72 FR 60531), “Protection of Striped Bass and Red Drum Fish Populations,” which declared it the policy of the United States to prohibit the sale of striped bass caught in the EEZ." 4) To the issue on the best available science on the striped bass biomass, this is documented on the ASMFC website with these statements copied from the page, "2016 Atlantic striped bass stock assessment indicates the resource is not overfished nor experiencing overfishing relative to the biological reference points as well as total fishing mortality (F) is estimated at 0.16 in 2015, a value below both the F threshold and target levels (0.22 and 0.18, respectively)." Note that the Female SSB has trended downward yet recruitment has notably risen. Until such time when the next peer reviewed stock assessment comes out, this is your guidance from regulators on the health of the stock. 5) The impact of and on spawning in the Block Island Transit Zone area..... folks, I would highly recommend to "inform oneself" on where the various noted stocks (North Carolina (Albemarle Sound ‐ Roanoke River/Chesapeake Complex and Hudson/Raritan River) of striped bass 'spawn.' The SB - BITZ is noted as one area along the Mid-Atlantic and New England region for the "migratory movement," both north and eastward in the spring then south and westward in the fall of SB to their respective wintering grounds. 6) To answer the question about the impact on 'HARVEST' if the SB - BITZ is opened, and the fact is there will be little if any change in recreational angling behavior. It is doubtful if there will spur a (or any) increase in 'recreational' vessels fishing, or increasing retention of striped bass due to this small area now being opened to 'recreational' harvest. 7) Another question which has been mentioned to me is on the reduction NYS fishermen took just a few year ago when fishery regulators in the once Empire State pledged to take a 28% reduction for the benefit of the biomass. What happened during two winter MRAC meetings, and "dog and pony show" that was performed at the following March meeting where those in the audience (as well as most on the MRAC) found out just two minutes before the start of the meeting about a cut in the possession limit from two to one striped bass. As the owner of the largest party boat in New York said to me, "for the customer, whatever the percentage cut that it comes out to, doesn't matter. Going from two to one fish is a 50 percent cut to both our business and to those fishermen who wish to take home two fish." Needless to say, many here have not forgotten how distasteful, disingenuous, and in the end at the meeting how it played out at DEC bunker over this issue. So the question then becomes on why the resistance by many of the commenters against this particular area opening and it is due to the propaganda by some noted fishermen, as well fishing websites and publications that somehow have equated that this will lead to the opening of the EEZ to striped bass fishing and as much the harvest of striped bass in waters greater than three miles of a shoreline. Once again this is highly doubtful due to a number of NOAA regulatory and legal issues which would have to be changed/modified as well as what we can conceive would result in legal challenges (lawsuits over the following years) by various fishing organizations. If one had to sum up their support for the SB - BITZ issue, it comes down to, and I repeat, whether this will change the fishing behavior in this small area. It is no secret to what is going on within this small sliver of ocean in the EEZ, and once again it is akin to the "55 mph speed limit...only obeyed when the PoPo are is around." Does anyone doubt this? The vast majority of recreational fishermen understand the value of a marine resource, and if you are conservation minded, then either release all, or most of the striped bass you catch during the season. Can we also remind those against the opening that we are talking about a species where the retention limit is one fish for the three states in question which will be impacted by a change in an opening. Further, there is not one study (never mind one that has been peer reviewed) if the opening of the SB - BITZ will have any defined negative impact on the striped bass biomass. Can those opposed to this opening present scientific literature that this would be detrimental to the striped bass stock? "What is the actual reason or better yet, "on the water reality" on why you are seeing and more so catching less fish along the shoreline during the season? Is it not due to what is apparent with the more extreme warming of the waters along our shoreline in contrast to the size of the biomass of striped bass as well as bluefish (which has been a common complaint mentioned this year at the bluefish scoping meetings)? * As of 1400hrs - 10/18/18, there are "613 Comments Received" and many more coming until the Closing Comments Due by Nov 19, 2018 11:59 PM.